St. Clare of Assisi was born into a wealthy Italian family but soon shunned her luxurious upbringing to embrace the life of piety and poverty. Inspired by the words of Francis of Assisi, Clare fled her home and joined Francis, establishing her own religious order. The group became known for their austere and devout lifestyle and for the power of their prayer, which is credited with saving Assisi from invaders twice. After Francis' death, Clare continued his work and broadened her own influence. Clare died in 1253 and was canonized two years later by Pope Alexander IV. Clare was born in Assisi, Italy, in 1193 to wealthy parents, and was taught to read and write as well as spin yarn and do needlework. She had little interest in her luxurious surroundings (she lived in a palace), and influenced by her mother's religious devotion, Clare dedicated her life to God at an early age. She also showed early on that her calling would involve helping the poor, as she set aside food from her family table to give to the needy on the streets. When Clare was 18, Francis of Assisi came to preach in the church of San Giorgio at Assisi. Inspired by his words, Clare asked Francis to help her in dedicating her life to God, and he vowed to do so. The following year (1211), Clare's parents chose a wealthy young man for Clare to marry, but she pointedly refused, fleeing soon after for the Porziuncola Chapel, where Francis received her. She took vows dedicating her life to God, and that moment, occurring on March 20, 1212, marked the beginning of the Second Order of St. Francis. Clare became the abbess of San Damiano in 1216, and, while spending her days doing manual labor and praying, she began dedicating much of her time to changing the governing rule (established by the pope) of the order from the Benedictine spirit to one of the newly established Franciscan rule. (Two days before Clare died, Pope Innocent IV finally approved her request.) 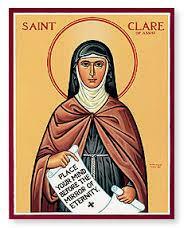 The order became known for its life of abject poverty and committed life of prayer, prayer that Clare used to attain worldly victories that are credited with saving Assisi on two occasions. The first involved Clare raising the Host up in a window, thereby causing Frederick II's invading troops to fall back. In the second instance, Assisi was again under attack. Clare and her nuns prayed for the safety of their town, and a storm swept in and scattered the attackers. Clare cared for Francis toward the end of his life and was with him when he died in 1226. Afterward, despite ill health, Clare continued to promote the growth of her order until her death in 1253. In August 1255, Pope Alexander IV canonized Clare, and today the Order of St. Clare numbers more than 20,000 sisters worldwide, with more than 70 countries represented.